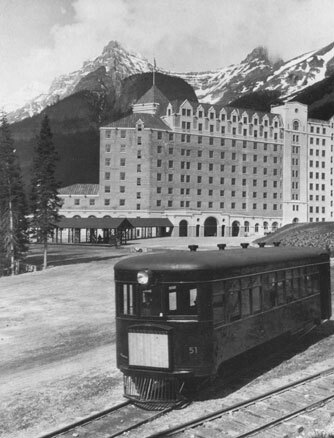 The Lake Louise Tramway was a unique operation like no other in Canada. 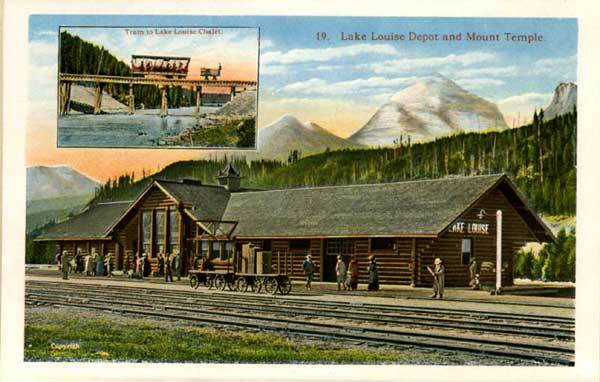 It was a narrow gauge (42 inch) line built in 1912 by the Canadian Pacific Railway to transport passengers to and from its Chalet Lake Louise in the Rocky Mountains of Alberta. It was operated under the Hotel Department. 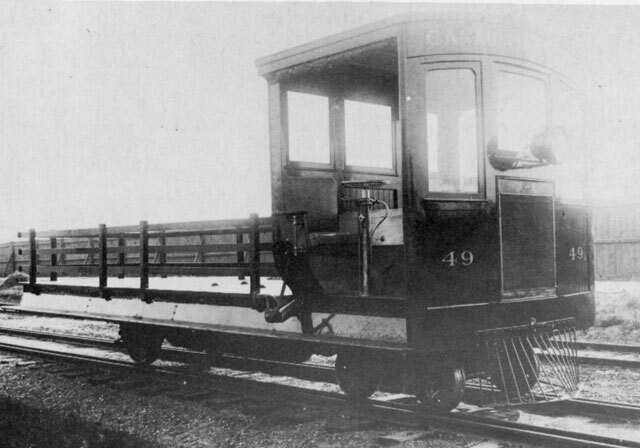 Constructed as a short branch of its system, the CPR just overlooked telling the federal government it was going to be narrow gauge! This got around the need for local approval of building the line. The need for this short railway line came about due to the ever increasing number of guests travelling on the CPR to vacation at their chalet. 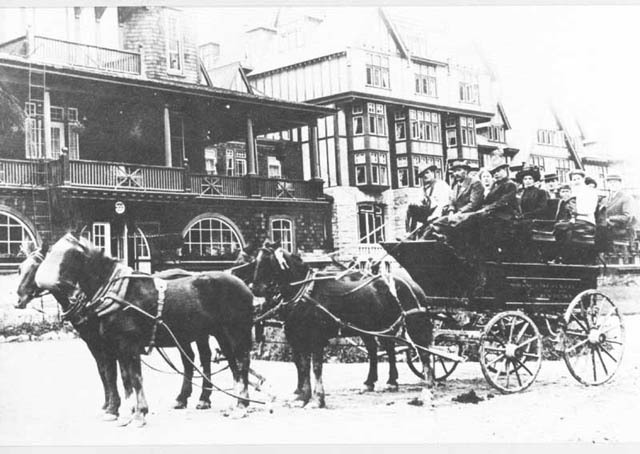 A major expansion of the chalet was being constructed in 1912-13 which would add another 350 rooms to the earlier 1899-1908 construction. Horse drawn vehicles were taking from an hour to an hour and a half to make their way up the steep climb of 800 feet in elevation. Complaints about cruelty to the animals prompted a change. At left is the old wooden chalet, later destoyed by fire, while on the right is the new stone addition. The line began at Laggan station, immediately crossed the Bow River and abruptly turned back and made its way across Louise Creek and up a twisting path with sharp curves and a 4% grade to a loop at the chalet. The line was 3.61 miles long with a passing track, about equal to the distance by road. A turntable at Laggan was later replaced with a second loop. Cars were operated to meet all trains, making many roundtrips daily throughout the season from May until early September. 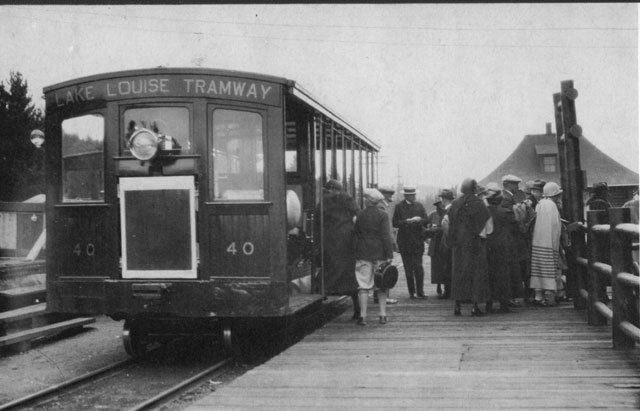 It was also operated through the winter 1912-13 to aid in the construction work on the chalet expansion. Canadian Pacific with small baggage trailer. The original equipment was acquired from Pierce-Arrow Motor Car Co., Buffalo; delivered on July 31, 1912. It consisted of two 28 foot open bench passenger cars (40 and 41) that seated 35 and weighed about 10 tons; and two open freight cars for luggage (48 and 49), all were self-propelled with gasolene engines. 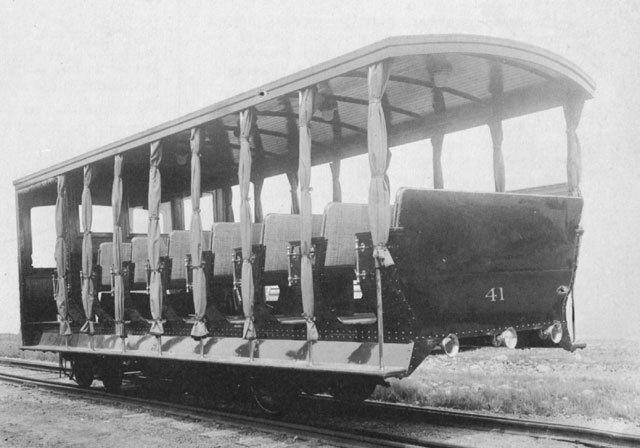 It was soon decided a third passenger car was of more use and in April 1914 car 48 was rebuilt into passenger car 42. In 1925, two new cars were added. This time bigger enclosed cars were built. Delivered May 27, 1925, they seated 43 passengers, weighed 17 tons and were powered by Sterling 6 cylinder 150 horsepower gas engines. 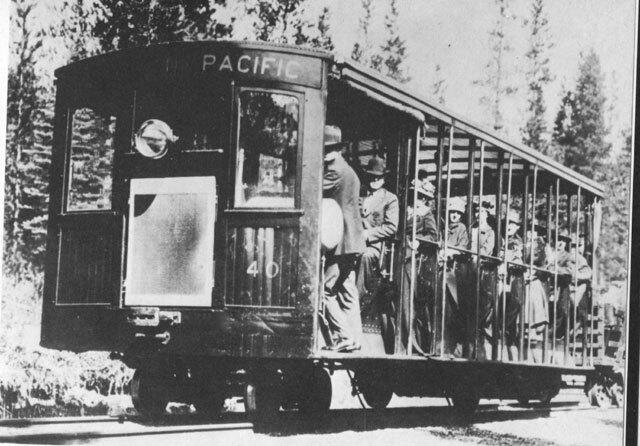 The original cars remained in use for busy traffic times. 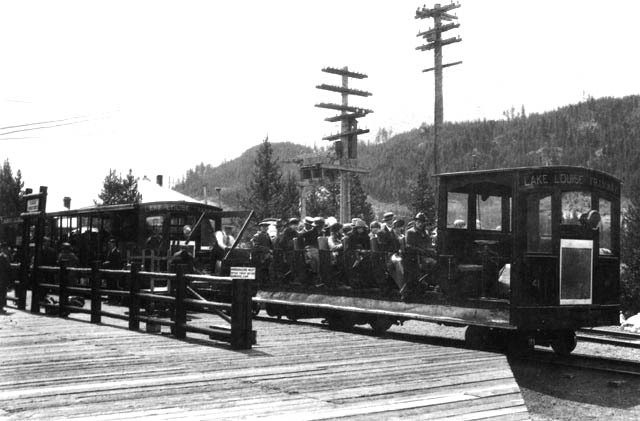 The new equipment was short-lived as the service was closed down at the end of the 1930 season, possibly affected by the Great Depression and/or improved motor vehicles making the short trip. Rail was lifted in 1931 and unfortunately, the choice of narrow gauge prevented reuse of the equipment elsewhere on the CPR.